Hiding away in one of the main gun halls and not even in the ‘airsoft village area’ the boys from Airsoft Action noted a few ‘hidden’ or possibly ‘disregarded’ airsoft gems on the SHIELD Firearms and Sights stand – to save them from being overlooked or missed a couple of them had a ‘repatriation’ to the Airsoft Action stand where they could be appreciated by airsofters. 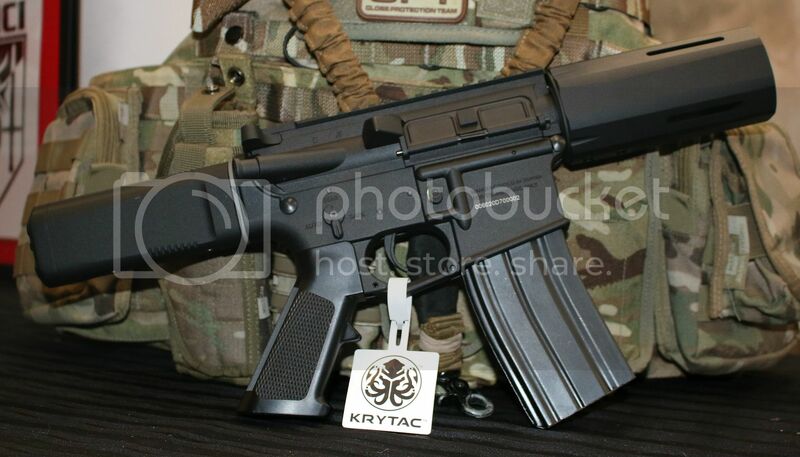 This meant that the relocated Krytac Trident SPR and SDP was able to garner a lot of attention from airsofters visiting the Airsoft Action stand – these were possibly the first instances in the UK of these Krytac branded AEGs. 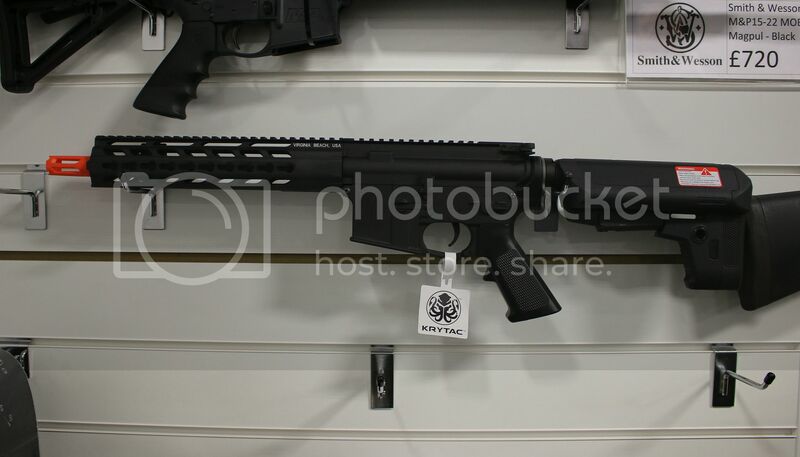 The SDP was certainly getting a lot of attention, it just looks so different from other CQB type models. 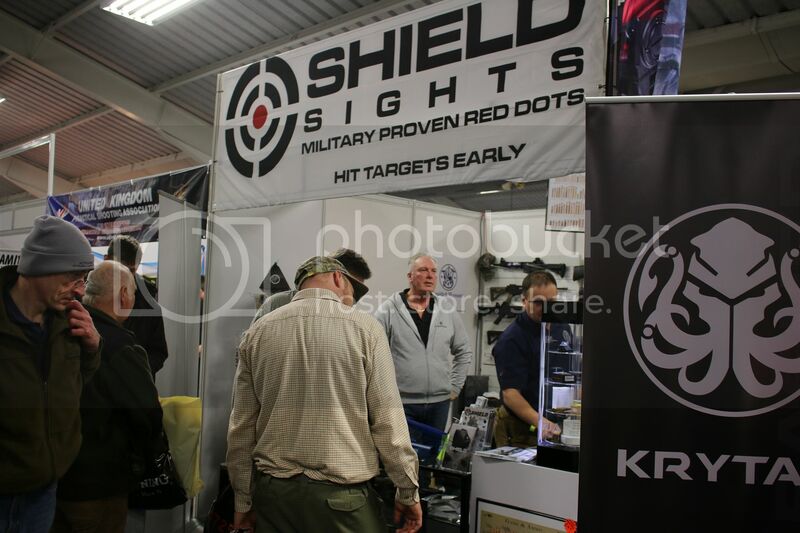 The guys at SHIELD Firearms and Sights stand still had the Trident PDW and CRB models on display and Ken Saville assured us that all these models should arrive in UK soon with distribution via SHIELD (for trade enquiries please contact ken@shieldpsd.com. 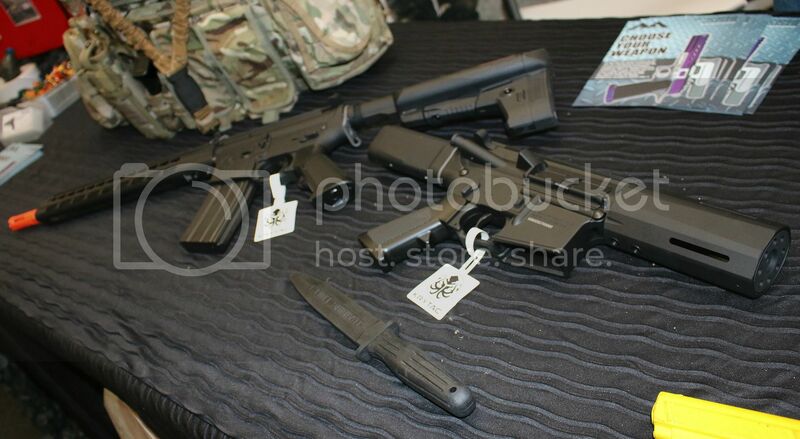 Checking these AEGs out (but keep in mind we didn’t fire them) the quality seemed spot on and well finished. I was certainly impressed. Compact design, lightweight and full metal with ambi fire selector and locking bolt with access to the numbered rotary hop unit with 15 settings. The battery is housed in the unique buffer tube. 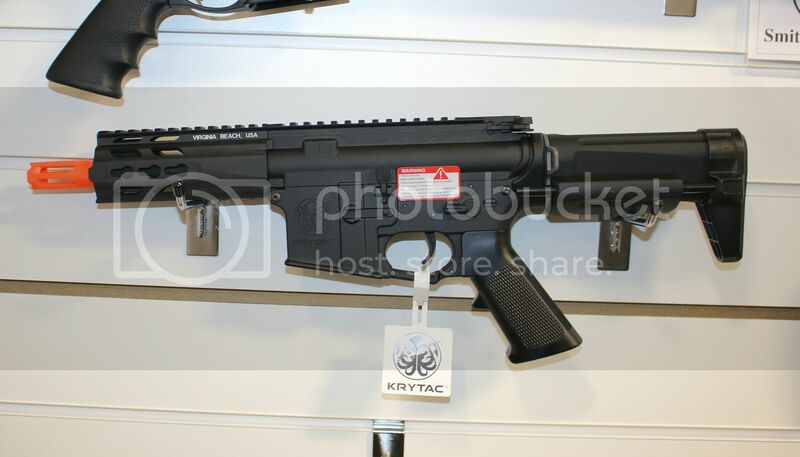 The AEG is fitted with a mosfet which should help protect trigger contacts and the receiver is stamped with the Krytac logo and each AEG is individually serial numbered. With a 14.5” barrel and a 13” free floating DEFIANCE keymod hand rail the player is spoiled for choice for custom options on this AEG. Again a rotary hop up with 15 adjustment settings accessed via the locking bolt. Batteries are held in the stock and you can use nun-chuck style or small lipo brick battery at the rear of the stock in front of the buttpad (or a stick battery in the buffer tube). 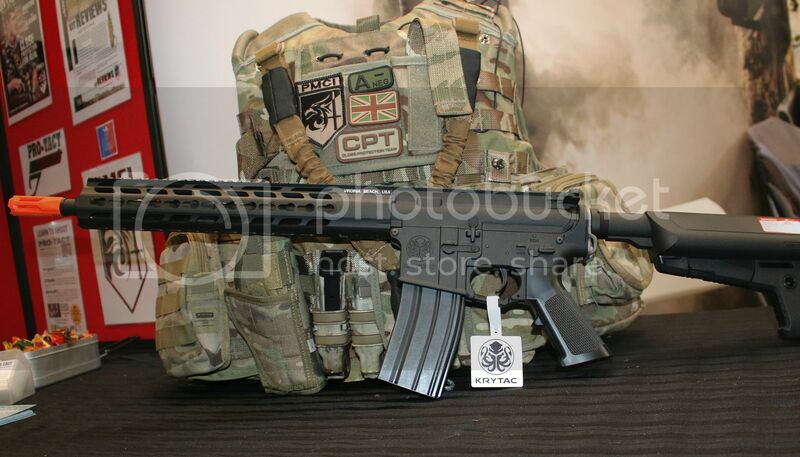 These were great looking AEG’s and appear well finished – initial thoughts on pricing are lower £200 bench mark for the SDP and upper £200 for the SPR – however these are only best guesses at this point. Update from the boys at Airsoft Action Magazine...the first UK review of these AEGs will be in the next issue of the magazine out 12th March.